Monday was bad, so terrible they called it Lundi Noir. Today it is the turn of the Asian market to meltdown. Husband was telling me Barclays shares are worth only 90p, c'est vraiment incroyable. My husband, like all other Singaporeans I know who has ever studied in France, is crazy about couscous. He said that it is the closest thing in the university cafeteria to Asian food because it has a highly absorbent grain base like rice, and is served with meats and vegetables which is faintly curry like and the harissa is a kind of sambal substitute. Kind of like how I used to look forward to the days when hospital cafeterias in UK (I have eaten at many, and often) served chilli con carne, the meat I could never determine was real or not but the spiciness was both familiar and comforting, even if the rice was more often than not very cold and very hard. So, there we were, one chilly September afternoon, on the way to depositing the dogs at the groomer, husband noted that Al-Mounia (16 rue de Magdebourg, 16th arr, T: 01 47 27 57 28) was open so he suggested we go in. He's already eaten an earlier lunch of cheese sandwich and yet he could not resist this, my curiosity was piqued in spite of my reservations about couscous. The interior is beautiful, all carved woods and worked metal. It may sound cliché but the atmosphere managed to transport us somewhere more exotic, like Fez or Marakkesh. We sat on cushioned divans and nibbled on olives. 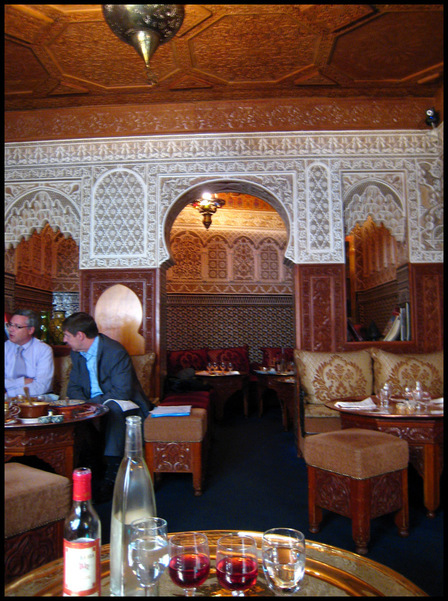 The space is divided into two antechambers, as it was Ramadhan the clientele was sparse, mostly French business people. 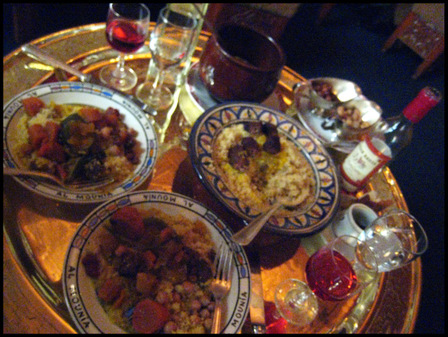 We ordered pastilla to share and a portion of couscous a l'agneau brochette (grilled skewered lamb). There's no merquez in the menu, husband joked that the place is too classy for the spicy sausage. He was taken here for lunch by an acquitance who works at Singapore Airlines which has an office nearby; a man who, surprise surprise, studied in France when he was younger and whose wife also doen't care much for couscous. 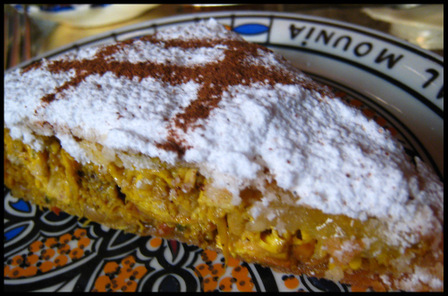 The pastilla arrived. They spilt it into two before serving, very considerate. This was an excellent version. The best I have eaten was at the well known 404 (69 rue des Gravailliers, 3rd arr, T: 01 42 74 57 81) but this was just as good. The balance between savoury, meaty, spicy and sweet is excellent, the cinammon barely perceptible as I prefer it, just enough to assert its warm spiciness and tame the sugar but not enough to turn this into an American dessert. Our single portion of couscous arrived. (The lighting was too dim, hence the poor quality of the images) Fluffy grains with fetchingly charred lamb chunks and caramelised onion in the middle. A big jar of vegetables in broth. Sidekicks of raisins, chickpeas and harrissa. I was very impressed. The meat was yummy. The broth was delicious, clearly meaty but still brightly clear, the vegetables done to a tender turn, everything soaked up in an instant by the couscous. This may well be my favourite coucous yet, it is certainly husband's. He went back two days later with his colleagues. Before this I favoured the couscous at Le Marche des Enfants Rouge, that is good too but I may have been more swayed by their merguez sausages. As for the other restaurants we've tried, I find Chez Omar's (47 rue de Bretagne) too watered down, Le Souk (1 rue Keller) plain weird, Sensi Dar Faudel (1 bis, rue Jean Mermoz in the 8th) actually not bad but the dining room is always empty, and that of L'Atlas (12 Blvd St Germaine) rather pedestrian. We'll probably not stray further because Al-Mounia is not far from our apartment, and the dogs do have to venture to that neighbourhood for their routine groomings. We are now officially a coucous eating household, we even order delivery versions. 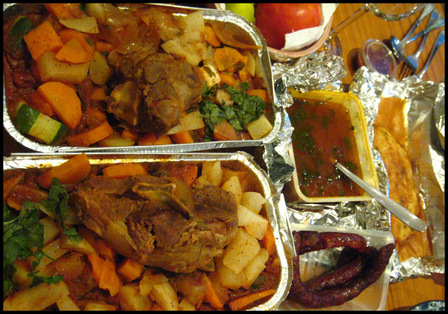 Our favourite is from Allo Coucous, which we find serves a more tasty, and generous version compared to their competitors. Their minimum order of couscous is for two people, see image above, which actually fed the three of us for two days and we still could not finish everything. This was a lamb couscous and the meat was tender without being overcooked. Excellent. Their briks are very tasty inside but the journey in the delivery man's motorbike made the skin rubbery but still okay, little V ate the better part of it.